But last Saturday a fellow ELA and I headed to the lovely city of Augsburg for a little day trip. I'm not even going to pretend there's any other reason we chose Augsburg other than the fact there is an apple shop there and my phone isn't working properly happy days. 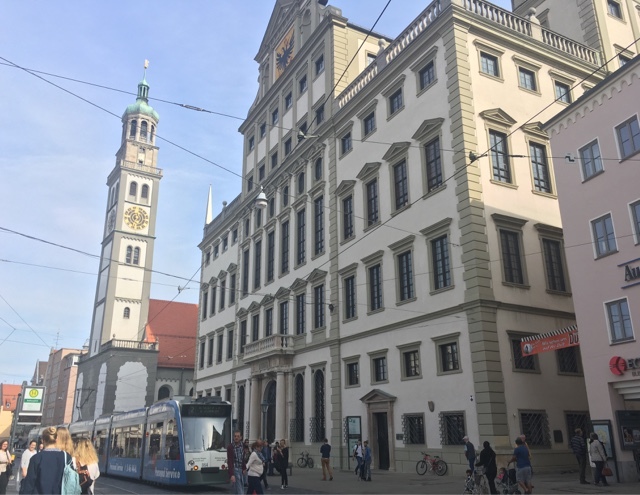 But back to Augsburg itself; it is the third largest city in Bayern after Munich and Nuernberg with a population of just under 300,000. 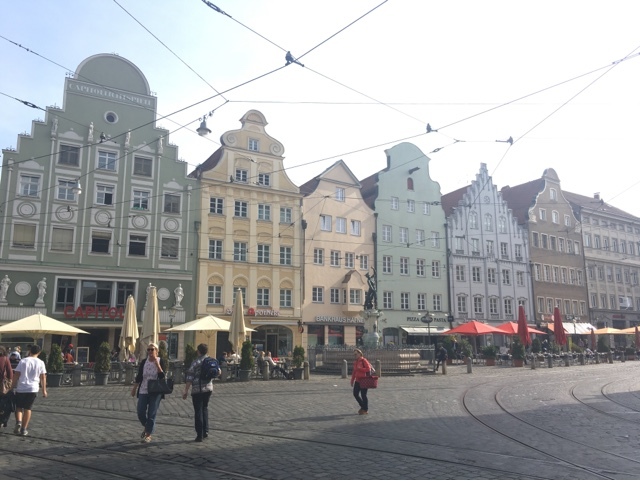 Located on the Romantic Road, Augsburg is very different from Nuernberg which you can see in some of the photos in this post. Almost all the buildings are a creamy white or pastel shade and have some of the most beautiful simple but visually impactful architecture. 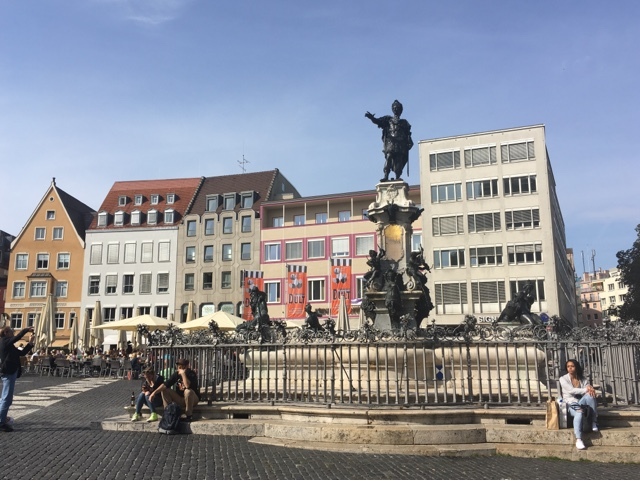 Easily accessible from Nuernberg - either a simple changeover at Ingolstadt or a straight train from the hbf it is the perfect place for a day trip. 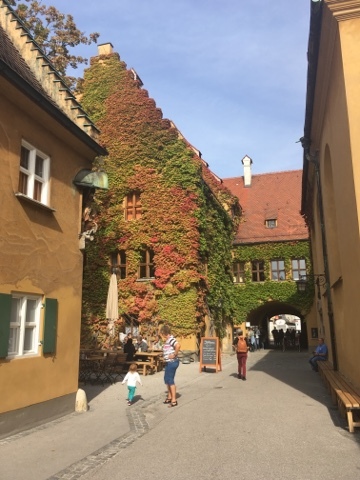 We started off our day by heading to the "Fuggerei" which is known as the oldest social settlement in the world. 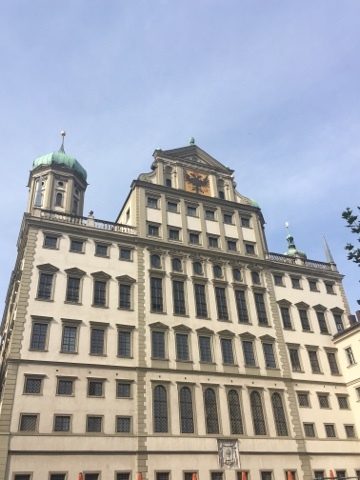 (see above photo) Built in 1521 and donated to the poor citizens of the city of Augsburg the settlement was greatly destroyed during the war. The wartime bunker has been turned into a museum for the settlement and it's restoration journey and is told in big plaques in both German and English (thankfully) so it is definitely something worth visiting. They have a really interesting collection of objects and there was something so sobering being in a cold bunker confronted with such destruction whilst it was over 20 degrees outside. Now the coolest thing about the Fuggerei is that people actually still live there" For only 88 cent a year you can basically live in a museum. How cool is that! As we were wandering around there were residents sitting in their garden soaking up the beautiful Bavarian sunshine it was so cute! After the Fuggerei we decided that it was most definitely time for lunch. I wish I could remember the name of the restaurant but I cant. However it is significant as it was my first Currywurst since being in Germany! For anyone that doesn't know, currywurst isn't a sausage with curry sauce oh no! It is in fact a sausage with tomato sauce and curry powder on top! Sounds amazing eh. Only issue I had with it was they also put curry pwder on the "salad". I use the word salad liberally, there was a bit of lettuce and tomato and a slice of cucumber. It was not a salad yet still wrong on so many levels. Despite the curried lettuce our lunch was perfect and we headed off to the Apple shop quite content. 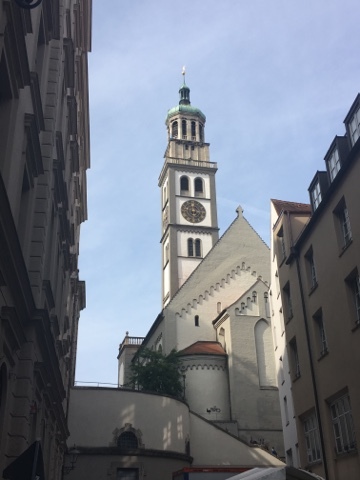 However our endeavours were in vain and the Apple shop were useless so stay tuned for a blog post soon about a day trip to Munich cause guess what? There's an apple shop there! Another thing that was on our to-do list because we are both super cool was to visit the birthplace of Bertolt Brecht. If you don't know who Brecht is I am not even going to bother explaining; I am both envious of your blissful innocence and simultaneously if you study German pretty concerned... Now the Brecht Haus was interesting but I wouldn't really recommend it unless you were a diehard fan. All the information boards were in German and despite some pretty interesting little displays and some cute pictures of baby brecht there wasn't much to see, only sheets and sheets of German to read. Probably best done at the start of the day and not when you are tired and have walked miles and miles.. 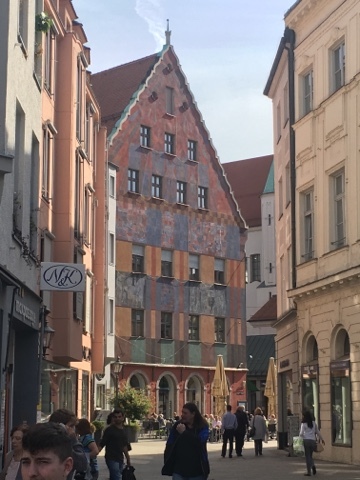 I loved my day in Augsburg and it is definitely somewhere I want to revisit. I have a friend staying there this year so perhaps I will get a chance to go back and see a different and more local side of the city. I have some pretty exciting posts coming up if I do say so myself so make sure you check back in a few days to hear about all the other exciting things I have been getting up to! You can also follow me on twitter, Bloglovin and Instagram if you so desire - links at the side!